Weird things you can grow: Good King Henry! For whatever reason, I just can’t resist a weird plant. I would much rather grow a weird plant than a normal plant. Which is why I’ve created a new recurring feature on my blog entitled Weird Things You Can Grow! I know! Exciting, right? it has an awesome name/history, as indicated above. Named for a GREMLIN! With GOOSE’S FEET! What could be more fun than that? it’s pretty tasty. I don’t find that it has a super-strong taste. At my house, we eat it fresh in salad (mixed with other types of greens) and sometimes cook it in the same ways you would use spinach; in pasta, in casseroles, etc. it grows in the shade (although probably not well in full shade) and will form kind of a nice-looking groundcover. WHICH YOU CAN EAT. it’s hardy. I have it growing now in half a dozen places in my yard, and I’ve only ever lost one plant over the winter – and that was in quite a big pot, which I took no steps to overwinter properly. 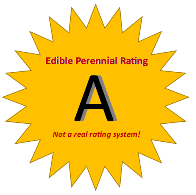 I give it an Edible Perennial Rating (EPR) of A for being hardy (and not requiring any babying), relatively prolific, a good grower without getting overwhelming, and growing in the shade like a BOSS. I’ve had pretty good luck growing Good King Henry from seed – I’ve grown it three years in a row from one packet of seeds I ordered from Seeds of Victoria (see their Vegetables page), and have gotten a few new seedlings every year to plant or give away. If you grow it from seed, start it indoors (probably too late for this year) and then plant it out into its permanent location; don’t try to move it around. And don’t eat much (or anything) from it the first year to let it establish itself. It will even self-sow a little bit, although in my garden I’ve gotten maybe one or two new plants this way, so it certainly isn’t going to overwhelm you. *You should not make a salad of just GKH. Or rather, you can, but if you do, you shouldn’t eat it. It’s high in oxalic acid (as are lots of other vegetables, including spinach! ), which will make you sick if you eat too much of it, and which binds to calcium, making it harder for your body to absorb the calcium. This is an especially dangerous compound for people who are prone to kidney stones. I tried to find a link with more information about this, but they all seemed like they were written by people who wanted to sell me natural health products of various kinds, so I propose you do your own research.